I ended up getting towed to Hilton Head so a Westerbeke Dealer could help me diagnose and then sell me a new engine. I found Marine Techs to be a good fair company. Everything is expensive but I didn't find anything that was unreasonable on hours which was my biggest worry. Overall, the engine came out easily and back in easily. I did the unhooking and rehooking of the engine along with the engine alignment. Saved a number of hours in the process. They transfered my accessories over which allowed for a good warrenty. 888.2 Paint, Brushes, Cleaner, Degreaser Cleaned bilge for engine and the two compartments for propane and storage. Painted all three with Rustolium White. This is the only good thing that can come from an engine failure. Sept 11, 2010 754.5 Circulating waterpump and gaskets Water pump failed on the Potomac. I fixed it by putting on a new pump from Engines 1 - Westerbeke - Bernie picked it up for me! Aug 8, 2010 662.2 Labor Troubleshot problem with autohelm drive and found wire inside motor housing broken. Repaired and it works fine again. Aug 10, 2010 670.4 Oils, Fuel filters, Zinc Changed engine oil & filter, trans oil, fuel filters, zinc. May 20, 2010 455 Oil, Filter Changed engine oil and filter and transmission oil. May 13,2010 409.3 None Aligned outdrive with rudders. Marked center on the steering wheel. Apr 13, 2010 339 Repaired Prop Found a minor bend in one blade of the prop. Had it straghtened and I then painted it, regreased shaft and replaced the spare prop back with the repaired one. Apr 8, 2010 336 Oil, Oil Filter Changed oil in engine and filter/trans. Mar 17, 2010 286 Synthetic Hypoid 75-90 Changed outdrive oil, checked all other oils. Mar 2, 2010 240 Fuel Filters Replaced fuel filters, fixed bolt on back of plate holding the fuel pump which solved problem with the engine slowing at times. Jan 24, 2010 229 Racor 120 AS Filter assembly and a R12S filter Created a fuel polishing system from a Racor Filter base, filter and drain base. I used a generic diesel pump with 5/16 fuel line. The suction line has a brass push-in connector on the end so it will stay on the bottom of the tank. I am planning on running the filter for one hour on each tank when I polish the fuel. Changed oil and oil filter on the engine, oil on transmission, and the alternator belt which I used the right size of the Napa belt verses the westerbeke belt. Also, I adjusted the valves on the engine. Jan 10, 2010 223 30 W Oil and New air Filter Changed oil and replaced air filter on the Honda 2000i - This has run forever! Dec 29, 2009 221 West Marine Model 138792 Chromed Brass Thru-Hull Vent Replaced both because the lock washers had rusted out and the rubber seal was then leaking. Nov 25, 2009 148 Synthetic Hypoid Oil Replaced oil in outdrive. Nov 18, 2009 105 Oil & Filter Replaced oil and filter on engine. Oct 2009 3443 Lexan Fabricated new windows for the front, long side windows and installed all. Sept 2009 3443 Mainsail to Sailcare Mainsail was sent to Sailcare and returned. It had some stiching reworked, cleaned, reresined and returned for a little less than $300. I think that is a great deal and the sail looks wonderful again. Sept 2009 3443 ST60 Tridata and Wind My wind instrument failed at the top of the mast. At least that was what I was told by Raymarine based on the voltage readings. I ordered new and replaced them. Ended up the wire in the mast is bad and I replaced it. I kept the new equipment however because the other was simply aging and now I'm current on technology. Mar 11, 2009 3211.6 Fuel Filters I changed both fuel filters although the primary only partially needed it and the secondary was clean. I changed them anyway just so I would have piece of mind. Time since last change was 300 hours. The enzime fuel treatment works!!! Feb 11, 2009 3202.5 34440 Impeller, Zinc cut off 1/2" Replaced the zinc, cleaned out end of heat exchanger and replaced impeller since I found 2 blades off and in the heat exchanger. All works great again and no leaks. Feb 6 & 7, 2009 3202 Raymarine Autohelm 4000+, Raymarine Ray54 VHF Radio Install new autohelm and VHF radio interfacing the radio to the GPS. Jan 12, 2009 3197.1 Synthetic Hypoid 80/90 Changed outdrive oil. If anyone is reading this maintenance log, be sure if you change the outdrive oil you allow time for it to drain into the leg when you refill it with oil. After filling it, ou will need to let it sit for an hour, add oil, run the leg up and then down a couple of times, add oil, then run the leg up overnight and then drop it the next morning and add more oil to ensure all the air is out of the leg and it is full of oil per the manufactures recommendation. I believe the reason many people have leg problems is because they don't ensure the leg is full before they start using it. That means they will loose the upper bearing from lack of lubrication. That is also why I use synthetic oil to increase lubrication. Nov 28, 2008 3140.2 Oil, Napa 1334 Oil Filter Changed oil in engine and transmission. Oct 31, 2008 3050 Oil, Napa 1334 Oil Filter Changed oil before getting underway this morning. Summer 2008 Boat Diet I put the boat on a diet and took 232 pounds off the boat and put 58 pounds back on with projects below. I still have to sell 2 anchors and 25 feet of 3/8ths chain so that I can then get a fotress anchor. I should net out about 60 or so more pounds off the boat. Oct 8, 2008 2915 Lexan Replaced the main window and the forward window above the berth. No leaks and good paint job. Sept 29, 2008 2915 Lots of material Sewed new sail cover, complete rear enclosure, rain cover for generator, shade for main window, seams on rear shade, new tops on cockpit cushions, laundry bag, clothes pin bags, and nose boot for dinghy. Added stainless structure for main window shade and handrails, support for bimini, solar panel arch, back rests. Overall, quite a bit of work but all worth it. Sept 28, 2008 2915 Oil, Oil Filter, Fuel Filters, spark plug, grease, zinc Changed oil on the engine and transmission. Changed filter on engine. Changed both fuel filters even though they didn't need it yet. (NOTE - It has been 275 hours since my last fuel filter change and they didn't really have to be done then. The change to an enzyme treatment in my fuel has made a HUGE difference.) Changed the zinc in the heat exchanger although it really didn't show much wear. Added some antifreeze to the fill container. Changed the spark plug in the generator. Changed oil in the generator. Lubricated the outdrive again with grease with the grease gun and it took it very well. Finally, used super lube synthetic grease to lube the ends of the steering cables. All is great and we are ready to go back cruising. Aug 2, 2008 Schafer 3003-50 Block The turning block that comes through the hull on the starboard side had frozen up. I found the exact replacement, ordered it and replaced it. This had significantly helped reduce the wheel force. Lesson learned, lubricate these blocks and the other blocks inside the hulls with T-9 every month. July 9, 2008 none I've done two calculations on fuel usage and at 2550 rpm's I use .7 gal per hour. It goes up as you go faster. With the fuel prices the way they are, I'm going back to this rpm again instead of 2650 when I was keeping up with others. July 7, 2008 2879 Zinc, Fan Changed Zinc in Heat Exchanger. Moved fan from Port Berth to Main Berth. Main one went bad. June 18, 2008 2786.7 30 W Oil, Oil Filter Changed oil on Engine. May 15, 2008 2689.1 Synthetic Hypoid Oil, 30 W Oil, Oil Filter, Synthetic Rotella Oil, Antenna, Motor Bracket Changed oil on outdrive, transmission and engine. Lubricated Outdrive. Troubleshot Radio Problem and replaced antenna. Replaced broken bracket on Engine. Scrubbed boat bottom and dinghy bottom. Cleaned up messes made by before mentioned maintenance. Apr 30, 2008 2672.6 Feet for Honda Generator, Oil Changed oil on Honda Generator and replaced the feet. They were expensive but they were falling off. We used this generator so far many many hours. For 3 years, we used it for weekending and since we've begun cruising, we use it about 4 hours a day for charging, cleaning (small vacuum), A/C, and of course T/V and video stuff. Perhaps excessive but Deb likes it. Apr 25, 2008 2670.2 16 Gauge Wire New Bulb Ran new steaming light wire. The old one fell out of the crimped connectors. Also I cleaned the light and replaced the bulb. Apr 18, 2008 none Note for file In an email from the Gemini List they noted the NAPA part number of #MPEST81SB, is the pre-heat solenoid. Followup email said: That's the correct number. Have them look up ST81SB or some variation of that, that's what the NAPA store did here. Tell them it's a pre-heat solenoid. Apr 18, 2008 2665.0 Lens for Bomar, Stud Fixed broken Bomar hatch with a new lens. Also, repaced a stud that backed out holding the plate for the fuel pump and filter. The one one the starboard side is the longer stud. I used blue locktite on it too. Mar 15 2652 Fuel Filters Changed both fuel filters although they really weren't bad. Problem was the ground. Feb 25, 2008 2595.9 Oil, Hypoid, Filter, Zinc Changed oil and filter in Engine, oil in Transmission and Outdrive. Changed Zinc in Heat Exchanger, cleaned Heat Exchanger, checked impeller. Vacuum guage still reading 5 psi. This is unprecidented for length of time for fuel filters and I attribute it to using an enzime fuel treatment rather than Bio-Bor. Feb 15 , 2008 2573.9 Oil, paint Changed oil in Honda Generator, Painted 10 pound propane tank for grill, checked vacuum gauge last time I ran engine and it was reading 5 psi. Nov 30, 2007 2469.8 Outdrive oil, sink drain, gray paint, small zinc Changed oil in outboard lower unit, cleaned all outside lower surfaces of outboard and painted, installed another zinc on outboard. Disassembled, cleaned (found quite a bit of dried grease) and lubricated with Superlube the winches. Replaced the sink drain in the head. Cleaned the vent for the holding tank. Cleaned the speed sensor. Took apart the flush/dry valve on head, cleaned and lubricated. Nov 17-25, 2007 2455.7 R11T Filter, Racor Vacuum Guage, 5 1/2 quarts hypoid oil, 1 quart oil, 2 new sink drains, spark plug, paid to have alternator rebuilt, Changed primary filter which didn't really need it, secondary didn't need it. Cleaned raw water intake. Adjusted rudder lines. Adjusted throttle rpm. Installed vacuum guage in the fuel system. Changed outdrive oil. Changed Honda Generator oil. Replaced the two sink drains in the kitchen sink. (Had to cut the old ones out with a hacksaw - fun job.) Installed new connector on the cable to talk to the GPS from the computer. Lubricate outdrive. Changed dinghy engine spark plug. Had Alternator Rebuilt. Nov 7, 2007 2403.4 30W oil for Transmission and 15-40W oil for engine Changed oil. Early for engine and just over 50 hours for the new transmission. Oct 31, 2007 2381.1 Alternator The tach quit working and I found the tab on the alternator had broken off where the tach gets the pickup from. Probably started when we changed the transmission. Good thing we freed up that bolt! Changed the alternator and the tach works fine now. The other alternator still charges so it can be a spare until I find a replacement. Oct 25, 2007 2342.5 Primary and Secondary Fuel filters, Transmission, Exhaust Elbow, Boiled out Heat Exchanger, Exhaust Hose, New Starter, New coolant hose on port side of transmission, added chafe protection to three places, new antifreeze, and the rear motor mounts. Replaced fuel filters in troubleshooting but they didn't need it. Replaced the slipping transmission, the exhaust elbow and cleaned the heat exchanger. Also replaced hoses that were deemed to be in need of replacement and installed all new antifreeze. I also added dielectric grease to electrical connectors and aligned the engine to the outdrive after installing the new rear motor mounts. For more information, you can visit the webpage for October 15, 2007. Oct 22, 2007 2340.8 Gel Coat and Alumnium Plate Floxed in Alumnium plate on each side of hull and then reparied gel coat per surveyor's specifications. Oct 20, 2007 2340.8 GFI's Installed GFI's in the 120V AC lines where necessary per surveyor's specifications. Oct 20, 2007 2340.8 Hose Clamps Added 4 hose clamps, one per end, to fuel fill lines to meet surveyor's specifications. Oct 16, 2007 2340.8 15w 40 Engine Oil Changed Engine oil. Oct 11, 2007 2310.7 Hypoid Oil Changed outdrive oil while boat was hauled for survey. 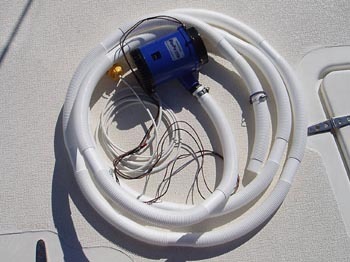 I wanted a big bilge pump that I could put in either hull before I went offshore again. I put this one together and it stores in the port hull. It emptied a 5 gal bucket of water in 4 seconds. Now all I need is my emergency patches for patching the hull. I hope to never use this pump. Sept 28, 2007 2276.9 Whale Gulper 220 pump Our shower pump never worked very well. It was an inline small pump and it would get clogged up very easy. I found out on the Gemini list serve that they are using the Whale Gulper 220 now. I had them get me one at our friendly West Marine store and I installed it. Fortunately, it fit too. The other hoses you see are spares that I keep stored here, I'm really not that bad at installations. One thing of note is that you do have to use some fittings to adapt the hose in the shower to the size of the pump. Regardless, it works great and will pump the shower dry now and since it has a check valve installed, no water comes back. Sept 28, 2007 2276.9 60 feet 1/4" G70 high test anchor chain and high strength shackles + 15 pound mushroom anchor for kettle. I replaced the 40 foot 5/16th anchor chain with 1/4 inch high test 60 foot chain. The chain weighs the same as the previous chain but this is much better for my back to lift. Overall, it provides the same strength and now longer. I also picked up a 15 pound anchor for a kettle which will keep the line lower in the water. Sept 26, 2007 2272.4 Primary and secondary filter Changed both filters after they clogged, underway. August 25, 2007 2225.0 Hydraulic Hose and fitting. I had to change the hose for the hydraulic pump for the outdrive. I also had to change the fitting. The fitting had corroded through. Fortunately, I had a spare on board. I also used epoxy and cotton flox to seal around the fitting. After it cured, I painted the epoxy and line twice. Hopefully this will protect it from the salt water. August 25, 2007 2225.0 Oil(engine, transmission & hypoid) and filter Changed oil for the engine, transmission and outdrive. July 12, 2007 2200.1 Dayton 1P808A Water Pump (The last one was Teel) We had the raw water pump fail on the A/C too. It ended up that was probably why it was going out on high pressure overload. It still needed recharging. I put a temporary washdown pump in to use it until I got this new pump. All is working well again. I also, put in a new o-ring in the filter and that has stopped a persistent drip. I also installed two water hose fittings in the outlet of the A/C so it will be easier to prime. July 3, 2007 2184.7 R-22 The A/C needed to be recharged. We obtained services from the company AMPM AC and Heat. Steve was a great guy here in Crisfield, MD. When finished the running amps were 9 amps for A/C and 1 amp for raw water pump. Pressures were 225 on the high side and 68 on the low side. It works great again. Perhaps it had a small leak. Hopefully this will last a few years. July 1, 2007 2184.7 8 O-Rings I was getting some minor leaks through the hatches where the locking unit goes through the plexiglas. I found the O-rings were cracked. I replaced them all and added some Super Lube to them as well. June 1, 2007 2112.3 30200 Fuel Filter Changed the secondary fuel filter - It was dirty so I replaced it. In addition, I found a couple of clamps loose that would have caused a slight air leak. I tightened them too. June 1, 2007 2112.3 R11T Fuel Filter Changed the primary fuel filter - It needed it so I checked the primary too. June 1, 2007 2112.3 4 Quarts Oil & 1334 Napa Oil Filter Changed engine oil and the oil filter. June 1, 2007 2112.3 34440 Impeller Kit Replaced the impeller. The previous day I had cleaned the raw water strainer but that didn't cause the water to come out in 3 seconds or less so I figured I had a bad impeller. June 1, 2007 2112.3 Zinc Replaced the Zinc in the heat exchanger. It wasn't totally gone but needed replacement. I removed the end of the heat exchanger and found 2 ends of the impeller plus, I cleaned out some weeds and zinc pieces. May 24, 2007 2066.5 Hypoid Oil Changed the outdrive oil. I was using synthetic but have now changed my mind and will be using a standard oil. I will be changing it more often than the synthetic. May 8, 2007 N/A NGK CR5HSB Spark Plug Replaced the spark plug on our Honda 2000i It was probably time since I hadn't replaced it since I purchased it 5 years ago. I found the old plug worn but still working good. I'll save the old one for a spare. May 5, 2007 2032.3 None Aligned the rudders and outdrive. Procedure documented in the project pages. April 27, 2007 1998.7 Lubricant - T-9 Lubricated the rudder rods, shifting lever, shifting rod at transmission, stop cable and the lock cable for outdrive. April 27, 2007 1998.7 None Checked the engine alignment. I expected it to be off a bit since the mounts should have "settled in." It was off a few thousands in the vertical direction so I adjusted it according to the procedure identified in my projects page. April 27, 2007 1998.7 none Fixed the center hinge on the exterior door. April 27, 2007 1998.7 Synthetic Oil Changed oil on the Honda Generator and inspected the air filter. April 27, 2007 1998.7 Synthetic Oil , NAPA 1334 Oil Filter Changed the oil on the transmission and engine along with the oil filter. Lubricated all of the engine controls and checked tension on the alternator belt. Topped off the outdrive oil with a couple ounces of hypoid oil and then lubricated it. One of the zerts had to be removed and cleaned. April 16, 2007 1980.3 9 feet double braided 3/8ths line Replaced the down haul for both rudders. Both were frayed. I also tightened both of the rudder steering clamps. Both sides were slightly loose. I had to tighten them snug and use a hammer to make sure they were both completely snug. I had heard some slight clicks when turning with a load on them. This should fix it. April 10 1959.4 None Calibrated the autohelm compass. The autohelm compass is now within a few degrees of the GPS compass when underway. This makes the initial tracking much better when I use the signals from the GPS to steer the autohelm. April 6 1959.1 Rebuild Kit Rebuilt the head. "Fun" job....... It works much better and really wasn't a hard job. Time was about 1 hour from start to finish. Removed everything from main bulkhead and Deb put on 2 coats of Cetol to re-coat the wood. This hasn't been reworked since the boat was new. Deb keeps it up with oil but this made a big difference. She has a few more projects to complete refinishing of all the wood. Deb wrote the following description because of an email request. Since our Gemini is eleven years old, it was designed with much more teak than the newer ones produced today. Some find that to be somewhat time intensive. I happen to enjoy working with wood, so I make it part of my weekly cleaning routine. First, we prefer a satin look inside rather than a high gloss appearance, which is on the floor boards and on the outside teak. To achieve this, I use a product named Cetol. There is a Cetol stain and a gloss. Inside, I lightly sand the wood with a 320 grit sandpaper, clean the wood well and use the Cetol stain, applying it with a foam brush. Two very light coats produces a deep and beautiful satin finish. On the outside of the boat, I sand with 180 grit sandpaper and work my way up to 320. Next I apply 2 coats of stain and then the gloss is applied last, which produces a gloss finish and protects the wood. When I do my regular cleaning on the inside of the boat, I use Old English furniture oil on the flat surfaces and Liquid Gold on the vertical surfaces. This cleans and freshens the wood. April 5 1959.1 Polyglow Washed entire boat and cleaned the sides. Put on 2 coats of Polyglow to refresh the sides. They are looking like new again with a great shine. March 30-April 1 1959.1 White Paint Quality Exterior Painted the sail locker and the starboard locker next to engine. This completes the painting of all lockers. March 23, 2007 1939.8 Secondary Fuel Filter 030200 Changed the Westerbeke filter. I don't think it was really bad however. The engine was dying and since I just changed the Racor I thought the filter was also needing changing. It wasn't really dirty. I also changed the fuel tanks and ran off of the other tank. I am going to check the vent when I get to Stuart. March 11, 2007 1911 None Inspected all fire extinguishers and marked them ok. All were in the green. March 11, 2007 1911 Part of a quart of synthetic Oil Changed oil in Honda 2000i generator. Mar 10, 2007 1909 Synthetic Hypoid Oil 5 quarts & waterproof grease Changed the outdrive oil at anchor and lubricated the external parts of the outdrive - Put grease in the grease zerts and on the lock down mechanism after spraying it with penetrating oil. Mar 9, 2007 1909 Front Engine Mounts Changed front engine mounts and aligned the engine. Vibration is now minimal and is noticeably better. Feb 24, 2007 1907 6 mil plastic I built a prototype shower enclosure for the aft deck. Deb didn't want to use the head shower because you then have to clean it up. On some nights it is too cool to go out and shower. We should now be able to install this and heat the area then have a great pressure shower with the shower pump device I built. I went to Marathon and got a new LED anchor light. The one I had was too dim and they have been giving tickets in the area for just that. I didn't receive one because I used several other lights too. Now I should be lit correctly. I went with this one ($120) because it has more options such as automatic on and off, a slow and fast strobe along with the option of sending SOS by way of the anchor light. Pretty cool and it only draws 160 ma which is .16 A. If you actually consider a 10W bulb draws approximately .8 amps that is a significant savings. Feb 24, 2007 1907 Synthetic Oil, Napa 1334 Gold Oil Filter, Napa Premium XL 7370 Belt Changed Oil in both engine and transmission with new oil pump - Great addition. Changed oil filter, Changed alternator belt. Old one had a few small pieces broken. The last one was changed at about 1500 hours. Feb 2007 Washdown pump, hose, connectors Designed and built a portable shower to use with the solar bag. This new system provides more pressure than a home shower and cleans your hair wonderfully according to my wife. Gen Note Various Propane I've found my propane tanks last about 13 days before changing them. We do quite a bit of cooking with the stove, oven, and broiler so that may make a difference in length. Based on past information from the previous owner this is about right. Oct. Nov. 2006 & Jan 2007 Various Paint Began the project of painting all of the lockers. I used the most expensive exterior latex and it really makes it easy to clean the lockers we have done. Hopefully will finish the last two before leaving Key West. Feb. 17, 2007 1905.1 Water Pump Impeller, Zinc Found 3 veins broken on the water pump Impeller when water was taking longer than usual to exit the exhaust. Found the 3 veins in the heat exchanger and cleaned it out. Also replaced the zinc and it was half gone. Dec. 2006 Shackles, stainless wire, Thimbles Rebuilt the ground tackle. Replaced a number of parts and respliced two of the anchor lines to new thimbles. Various Cetol Deb had done an excellent job at refreshing most of the wood work with Cetol. This is the same product the original owners used. She also oils the wood on a regular basis - twice a week - and it looks almost new. Nov. 2006 1700 Zinc Changed Zinc in Heat Exchanger. Didn't seem to really need it however. Nov. 2006 1650 House Water Pump Replaced the water pump at Pickwick Lake. Old one failed and it wasn't the pressure switch. I had one next day shipped in so we could continue with comfort. However, the foot pump worked well during our outage. Sept. 2006 1600 Lexan for all windows, degreaser, black paint, saber saw metal blades, lots of time Fabricated and replaced all of the windows on the boat. This project took 6 working days and is one of the most rewarding projects I have done. They are all clear with no crazing. What a great improvement. Feb note: Still clear, we are using 303 on them and hopefully it works. We have covers but since we are living on the boat we leave them off. I'm sure we will cover them in the summer but it opens the boat so much to have the covers off. Aug. 2006 1600 Zincs and Bearing for Outdrive Replaced the lower zinc on the outdrive in preparation for our cruise. Found the lower bearing had a bad bearing retainer. No damage but was able to find the right bearing in Paducah, KY and replaced it. We also shimmed the drive gear to take up play. July Aug, 2006 1600 Fair Hull The hull was faired then coated with Interlux 2000 and bottom paint used was Interlux Ultra with Bioguard. Note in February - I am very disappointed with the Ultra bottom paint and will not use again. May 2006 1600 Adjusted Valves They weren't out much but did need it. It was a pretty easy process. They adjusted just like the old beetle engine valves in my airplane. May 2006 1600 Rebuild Fuel Injectors I did this because we were getting ready to cruise and thought this would be a good time to have them done. Engine seemed to run better after this too. 2005 Washdown pump, hose, connectors Installed a washdown pump to clean the anchor chain, anchor and deck. Tee 'd off of the water intake for the head. 2005 1500 Horizontal Propane Tanks Replaced both propane tanks with new ones. The old ones had rusted. The new tanks also have a fuel indicator that actually works in both the vertical and horizontal position. These aren't pressure gauges but must be a float gauge. Compressor failed because of a collapsed exit water hose. Bad design - it was a garden hose and did not have a 90 degree fitting. Rather it was just bent. I had the compressor replaced with an 11,200 btu unit which drew 1 amp less. This allowed the system to easily run on the Honda Generator. I also installed the 90 degree fitting and could quickly see an increase in cooling water. Previously I had replaced the water pump for the AC unit. The old one had the shaft rust and it wouldn't turn. My guess is this was from using it in salt water. I found the pump at Granger. 2003 900 Engine Raw Water Pump Changed the water pump since it had a minor leak at the shaft. 2002 900 Bottom Job Bottom had blisters and too many of them, the hull was peeled and then filled. They used the right product but because of their bid they weren't able to get it totally fair. We agreed to splash it and then I would fair it later probably myself. Aug. 2002 1050 Refrigerator Replaced Dometic refrigerator with newer model after the old one wouldn't cool well. Dec. 2001 1000 Sails Cleaned Sent the sails to Sailcare and was very satisfied. Prior Information Hours are approximate until Feb. 19, 2007 Changed to Synthetic Oils in 2006, Napa 1334 Oil Filter Oil changes were conducted at 100 hours for the engine. Transmission and outdrive were changed at 150 hours prior to Jim's ownership. After being renamed to Freedom in 2001, those were changed at 100 hours too since there was so much sit time being at Ky Lake. This maintenance log was begun on February 19, 2007. The previous log was lost in a computer failure and I have done my best to remember prior maintenance and dates. I thought the web be a good place to keep the log and it might help others as well to see what and when we faced certain issues.